Colorado’s Best Practices Committee published a report for law enforcement on the points for a jurisdiction to consider when adopting a body worn camera policy. The Committee shared these findings with the state legislature and law enforcement community. Missouri’s Best Practices Committee appointed a subcommittee to examine the working relationship between prosecutors and crime labs in the state. The result has been a more collaborative and effective approach to collecting and analyzing forensic evidence in the state. North Carolina’s Best Practices Committee created manuals on appellate issues and ethics, both of which were distributed to all district attorneys in the state. Tennessee’s Justice and Professionalism Committee created a DVD series on the responsibilities of prosecutors. Each part of the series covers a different topic, including discovery, public records, privileges and immunities, and closing arguments. Virginia’s Justice and Professionalism Committee established a partnership with TC Williams School of Law at the University of Richmond. Eight law students are currently working with the Committee to examine issues involving the use of force and witness protection. Attendees also discussed the changing role of the prosecutor. Participants shared the ways in which their jobs have evolved in recent years, including increased community outreach, alternatives to incarceration and intelligence-driven prosecution. District Attorney Hillar Moore, a representative from Louisiana’s committee, delivered a presentation on the Baton Rouge Area Violence Elimination (BRAVE) program, a collaborative effort by prosecutors, law enforcement and community leaders to decrease violent crimes by youth offenders in the state. Tina Guccione, an assistant district attorney from Rockland County, New York presented on the Partnership for Safe Youth, a center that provides “wrap-around services” for at-risk youth and their families. “Existing committees have seen remarkable progress in a span of just a few years. 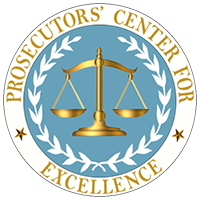 There is growing excitement and momentum behind the Best Practices movement as prosecutors are taking the lead in improving the criminal justice system,” said Kristine Hamann, Executive Director of PCE (www.pceinc.org), a think tank for prosecutors. Hamann is a former Visiting Fellow at the Bureau of Justice Assistance and former Executive Assistant District Attorney in the Manhattan District Attorney’s Office. The National Meeting created a forum for prosecutors from California, Colorado, Delaware, Illinois, Indiana, Iowa, Kansas, Louisiana, Maine, Maryland, Massachusetts, Minnesota, Mississippi, Missouri, Nebraska, New York, North Carolina, Pennsylvania, South Carolina, South Dakota, Tennessee, and Virginia to share their progress and to provide one another with advice on how to organize and run and Best Practices Committee. Also in attendance were representatives from the National District Attorneys Association (NDAA), The Department of Justice, the Bureau of Justice Assistance (BJA), and the National Juvenile Justice Prosecution Center at Georgetown University. The NDAA generously provided a space for the gathering, which took place immediately following its 2016 Capitol Conference. To date, senior prosecutors from 32 states have participated in regional and national best practices summits throughout the U.S. The earlier meetings were funded by BJA, a part of the U.S. Department of Justice whose mission is to provide leadership and services in grant administration and criminal justice policy development to support local, state, and tribal justice strategies to achieve safer communities.